Here are 24 brain-boosting activities for babies from birth through age 2, from the New Directions Institute of Infant Brain Development. Your newborn doesn't need to play yet. But he does need help staying calm while he gets to know his world. Giving him a massage will bond you and help his brain do its important early work. It might even help him sleep better. To begin, wash your hands, and rub them together with a little baby oil or lotion. Using gentle pressure - not too rough or too light - gently draw your finger tip down your baby’s arms and legs, one at a time, and rub the palms of his hands, the soles of his feet, and his temples. Massage the shoulders and back. Name the parts of his body as you massage them, so he hears your voice. Limit the massage to no more than three to five minutes at first (stop if you sense him tensing up), until he gets used to your touch. By massaging and calming your newborn, you keep him from becoming over-stimulated and help to start wiring his emotional center, deep in the middle of the brain. This bonding activity helps your baby feel secure, and lets his brain focus on the task of development. Children who feel secure learn better. Swaddle your child in a light weight blanket and hold her close. Dance slowly, moving to the rhythm of the music. Try lullabies, slow jazz, your favorite slow show tune or even a gentle indie track. You’ll give your baby a feeling of security and help calm her when she’s fussy. Building a pattern of security in the limbic system of your baby's brain helps your child begin to regulate herself - she’ll gradually learn to calm herself when she starts to feel upset. Children who have developed a capacity to regulate themselves find it easier to control their own behavior in the classroom. Select a toy that makes noise - maybe one with a rattle or bell inside, or even a small jar filled with dried beans. When your baby is alert and ready to play, hold him in your lap, gently shake the toy off to one side, and then slowly move it across his field of vision. When you get near the center of your child’s body, he may lose focus on the toy. Gently shake it again to reengage his attention, and continue moving it. Because young infants have not yet developed 20/20 vision, they are particularly attracted to movement. Your baby may only engage in this activity for a few moments at a time, but will delight in repeating it many times during the day. Our brains have two hemispheres - left and right. We process speech and grammar primarily on the left side of the brain, while metaphor and humor are processed on the right side. It’s important for the hemispheres to be strongly connected - and that begins with following a moving object with his eyes. Building the connections between the hemispheres -– what is known as cross-lateral function of the brain -– is critical for reading across a page. No, we’re not talking about teaching her to read. But your child is old enough to start looking at and listening to books. Choose board books with simple, bright, colorful pictures (for example, Colors by Howard Shooter). Hold your baby on your lap, with her back against your chest. As you read, name colors and label pictures. Point out details ("Look at the kitty. He has four legs!"). Don't worry that she can't understand you. She's listening anyway. By capturing your baby's attention, the bright colors help her brain learn to focus. At the same time, hearing your words helps your baby to build auditory connections in the parts of the brain used for language. Place your baby on his back. Grasp his hands and slowly pull him up. His neck and shoulder muscles aren't developed yet, so the head will lag a little. If your baby’s grasp is strong enough, let him hold your fingers while you pull him up to a sitting position and then slowly lower him back down. Make a game of it by saying "Going up!" each time, and your baby will want to do it over and over again. Next, with your baby still on his back, hold one foot in each hand and slowly move his legs up and down as if he were riding a bike. Now move his legs together, bending and straightening them. Sing to your baby while you move his legs in time to the music, and watch him relax. These exercises help your baby in two big ways: They help build connections in the brain’s motor strip, where movement is processed; and the pull-ups develop his shoulder muscles. 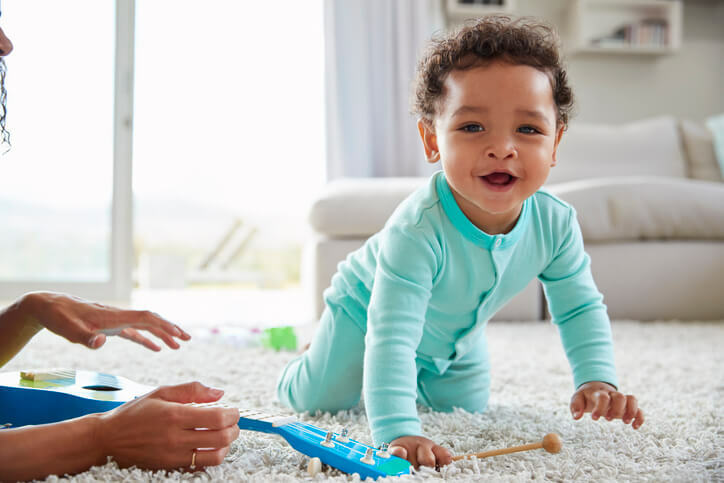 Babies need strong shoulder muscles to crawl, and crawling is an important developmental stage: As the baby uses his right hand and left knee to get around, his brain sends signals across the corpus callosum, which connects the hemispheres of his brain. Access your inner actor with this speaking game. Parentese is a way of talking that uses a higher pitch and slow, long vowel sounds (Loooook at the priiiiity baaaaaby! ), and babies find it very entertaining. Get close to to your child - you'll want your face to be 10 to 12 inches away - and as you talk, use exaggerated facial expressions and mouth movements. You’ll notice that your baby will lock her eyes onto your face in intense concentration and will smile at your antics. In fact, if you go back to your normal, flat way of talking, your baby will probably begin to squirm and coo to try and re-engage you. Parentese helps the baby begin to understand language because it matches the processing speed of her brain. Plus, babies learn language not only by listening, but also by watching and imitating mouth and tongue movements. This activity strengthens vision, listening and attention skills - all important for classroom learning. Make up a different sound for each part of your face - a sneeze for your nose or a tongue click for your mouth, for example. Sit with your baby facing you. Touch your nose and sneeze. Touch your mouth and click. Continue for your chin, eyes, ears and eyebrows. Allow your child to touch your face, and as he does, make the same sounds your face "made" and name the parts, too. Touch your child’s nose and see if he makes a sound at you! Your child is attending to the details of your face. Babies prefer human faces over any other shape. Attention to detail is important for the visual discrimination necessary in reading. Your child’s anatomy has changed: Her vocal tract has lengthened to resemble that of an adult and her larynx has descended in the throat (it won’t reach the adult level until age 3 - an infant can drink and breathe at the same time; an adult cannot). These changes make speech possible - but your baby doesn't know words yet, so she babbles. Respond to her with a smile and a conversation (”Is that so? Tell me all about it!” "Cool!") Your child will smile and babble right back. Don't expect it to mean anything - she's just experimenting with sounds. Keep up the conversation for as long as your baby seems interested… it is likely you will tire of the game long before she will! When they babble, babies use the sounds they hear in the language all around them. (A German baby babbles with different sounds than a Chinese baby.) When your baby babbles and you respond, you are helping to build the auditory and language centers of his brain. Your child is learning the conventions of language, too. With your back and forth “conversation," your child learns the basics of taking turns as well as the conventions of conversation. Join your baby in play by putting on funny hats. Allow him to direct the activity. Let him choose a hat for you to wear (you can make one from newspaper or a paper plate - the sillier the better) and then pretend you're a fireman, a baseball player, a princess… whatever fits the hat. Let him chose a hat for himself, too. Wear your silly hats to a tea party in the dining room. You are your child’s first plaything, and interacting in playful ways is more entertaining for your baby than any toy. Play is a critical part of building a brain. It's spontaneous, and there's no goal - your baby wants to play just because it's fun. And because play is pleasurable, children repeat the actions. This repetition results in patterns of activity in the brain that strengthen the connections between the neurons and help establish patterns of learning. Children who play are more creative and better problem solvers, both of which are important in science and math - and life in general. When your baby plays peek-a-boo, her brain is discovering object permanency - that is, even if you can’t see an object, it’s still there. A child who understands that things - and people - exist even when she can’t see them understands that Mom or Dad will return at the end of the school day. That knowledge makes starting school, and focusing on learning, easier. Sometimes playing with your food is a good thing! After lunch or dinner, drop a spoonful of pudding on your baby’s high-chair tray - any type of smooth pudding will work. With one finger, show him how to draw in the pudding. Lick your finger and smile. Invite him to draw in the pudding, too. Talk to him about how the pudding feels (cold, squishy, smooth) and about how his art looks (beautiful, like a circle, like a cat). If you want to save this piece of art, place a sheet of paper on top of it and press gently. The design will transfer to the paper. All learning takes place through information the senses deliver to the brain. The sense of touch is particularly strong around the mouth. This is why everything goes into a baby’s mouth! Painting activities also help your child develop fine-motor skills, which use the small muscles in his fingers. Children need fine motor skills in order to learn to write. On her first birthday, start a tradition of looking through your child’s baby album together. Set aside plenty of time, find a comfortable spot, and while you explore the album, talk about the day she was born, her first smile, when she walked or when she talked. Together with your baby, add the picture of her first birthday cake and her frosting face. Looking at pictures from her past - however recent - helps your baby build memories, and the positive moments boost her self-esteem and strengthen the bond between you. Just as the feeling of security you gave your newborn by massaging her set her up to be a better learner, helping your baby feel secure by sharing positive moments with her will help her in the classroom. Children who are more secure learn better. Buy bubbles or make your own solution by mixing water and dish washing detergent. Use about one part detergent (Dawn works best) to ten parts water. Make a bubble blower from a pipe cleaner, strawberry basket or dipper left over from dying Easter eggs. Dip it in the solution, and show your child how to blow gently to create a shimmering bubble - and then pop it! Encourage your child to blow, chase and pop the bubbles on his own. Play is fun, and all though childhood, fun is important to development because children want to repeat enjoyable actions. Repetition strengthens neural connections in the brain. Understanding cause and effect helps a child with reasoning tasks. Use a large house-painting brush and a bucket of water. Dip the brush in the water and paint a picture on the sidewalk. Watch as it disappears;then paint it again. Say, “Bye-bye picture!” as it evaporates. Invite your child to try too. You'll probably hear him try to mimic your"Bye-bye picture!" Muscles develop in order, starting with those closest to the body and moving onto those that are furthest from the body (shoulder and arm muscles develop before finger and wrist muscles). This painting activity uses large muscles and the whole arm. As you child gets more skilled, you can change to smaller brushes that exercise his hand and wrist muscles. This is the very beginning of writing - making controlled marks on paper… or the sidewalk! Remember the nursery rhymes from your childhood? (For a quick refresher of rhymes in English, check out the Web site mamalisa.com. Place your baby on your knees and bounce him in a steady rhythm as you chant the rhyme. Insert the child’s name in the rhyme wherever possible ("Johnny had a little lamb…"). Try different rhymes, and if there's one that your baby seems to like especially, repeat if often. This makes for a good bedtime ritual, too. Even pre-verbal children love to hear rhymes, because neurons that wire together fire together - in other words, just hearing words with the same sounds excites the same neurons and strengthens the connection between them. The pattern in rhyming words helps your child develop the ability to hear the differences in the sounds of language. Nursery rhymes are also great vocabulary builders. Where else will you hear words like "tuffet," "tumbling" and "candlestick"? Nursery rhymes help build basic concepts, vocabulary and a sense of rhythm, all important to reading and comprehension. Find a variety of textured materials - for example, a feather, foil, bubble wrap, sandpaper and a cotton ball. Allow your child to glue the objects on to squares of paper, using a nontoxic paper glue. Bind the pages together with yarn. "Read" the book with your child and let him feel the pages. Use words to describe the textures – tickly, smooth, bumpy,rough and soft. The brain learns through the senses. By connecting language to the textures that your baby feels through his sense of touch, you are using multiple means of making connections in the brain. Learning words for textures builds your baby's descriptive vocabulary. Children who know more words learn to read more easily. Playing ball exercises the area of the brain devoted to large motor skills - the large muscles of the arms and legs, which we use to run and jump. It also gives your child practice in turn-taking. Learning to take turns develops "inhibition skills" like knowing how to wait. These skills are important throughout school - in the play ground and in the classroom. Walk around your neighborhood with your toddler. Talk about the sounds you hear - a fire engine, the wind, a dog barking, a bird singing. Use lots of different words to describe what you hear. Ask your child to listen and tell you what she hears. By now, your child can probably say about 50 words. Having reached this milestone, he's on the brink of a language explosion. In the next few months he may learn about nine new words a day! Your child will now begin combining words into two- to three-word sentences that resemble a telegram - “No night-night!” “More milk”. Your neighborhood walk strengthens the auditory parts of the brain that store language and areas for planning and thinking. Your child's first experiences with learning to sound out words are often with simple alphabet books - one or two words and a picture per page. If the picture is of a bird and your child has no idea what a bird is, the chore becomes more difficult. If, however, your child knows "bird" and that the letter "B" makes the "buh" sound, he'll quickly figure out what the word says. In the longer run, children with the largest vocabulary learn to read more easily. Take a break in your kitchen, and gather some bowls, Tupperware or measuring cups that nest one inside the other. Put a plain place mat on the floor - it will "frame" your activity and focus your baby's attention. Sit beside your child. Say “Watch.”. Demonstrate nesting the objects from large to small, then take them apart and invite your baby to try. Because this is an activity perfectly suited to his stage of development, he'll probably jump right in, but if he seems confused for any length of time, help him. Don't forget to praise your baby for his efforts! This activity helps your child make connections in the math-processing parts of his brain that help him understand size (depth and width) and volume. He'll also build spatial and problem-solving skills. All these skills will come in handy when your child is in math class. On a warm day, put a blanket in the yard or park. Lie on your backs and watch the clouds roll by. Describe the shapes you see in the clouds - a sheep? A bird? Wait for your child to chime in, if he wants. Or watch him drift off to sleep. Brains need downtime to process new learning. Idle time allows the brain to wire up. It's not enough to just memorize facts. Creativity is using what’s in the brain’s memory, and downtime prepares the brain to be creative. After it's rained, go outside and play. Show your child how the water splashes when you jump into a puddle. Float paper boats, pine cones or leaves - and try to float rocks. Talk to your child about what happens in each case. Your child is beginning to understand the concept of cause and effect. You jump in a puddle, the water splashes. Some things sink, others float. Your child will test these ideas often, and seeing the same result each time builds connections in the brain. Understanding cause and effect will help your child with reasoning tasks that are especially useful in math and science. Remember tag? Touch your child and say, “Tag, you’re it!” Show her how to chase you. When she touches you, reverse roles and chase her. Don't be surprised if your toddler doesn’t completely understand the rules, and turns and reverses the game for no reason! Remember, this isn’t about winning! Tag is pure fun -it's also a game of repetition and reversal that strengthens the neural connections in your baby's brain and teaches about rules, like turn-taking. This is the beginning of understanding games with rules, a skill used throughout life. Put a large blanket or sheet over a card table, or over a couple of back-to-back chairs, to make a tent. Invite your child to take toys and books inside. Ask if you can enter. Have a picnic lunch in the tent. Your child feels secure in a safe, fun environment that she can share with loved ones. Feeling secure builds her senses of competency and confidence. A secure brain is free to expend energy on learning rather than survival. Children who are worried have much poorer memory skills. Secure children learn better. Although young children can't read, they certainly can learn to recognize their favorite cereal and chose their favorite DVD - based only on how the logo and colors and shape of the words look. So while you're out and about with your toddler, make a game out of "reading" the signs you see. Point out STOP, McDonald’s or railroad-crossing signs as well as the labels on juice boxes, bandages, cereal boxes... There's no end of environmental print. Encourage your child to identify logos or say the name of food labels. She'll get a kick out of being able to read, and running errands will be more fun for both of you. This type of "reading" teaches your toddler's brain to make a link between the sign and the thing it represents. Understanding that a symbol represents an object is a critical pre-reading skill.